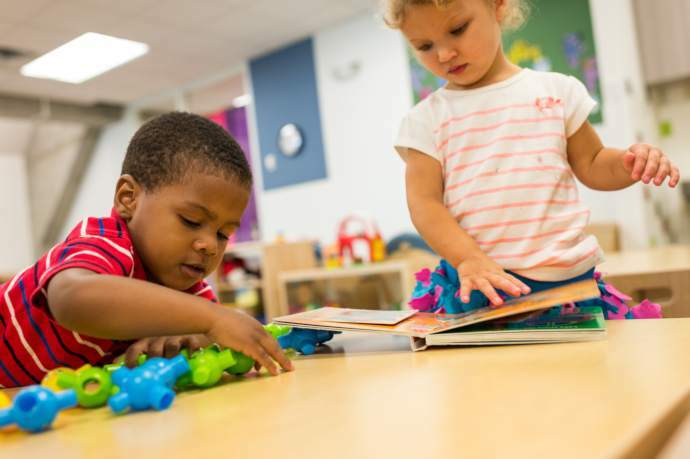 This week at YWCA Minneapolis, we are observing Week of the Young Child, an annual celebration hosted by the National Association for the Education of Young Children (NAEYC). At the center of this week are five fun-filled days celebrating our youngest learners with a different theme each day. Each of our five Children’s Centers plan a week chock-full of intentional, engaging activities for children and their families based on these themes: Music Monday, Tasty Tuesday, Work Together Wednesday, Artsy Thursday and Family Friday. Today is Work Together Wednesday and it is all about practicing skills that help make young children stronger emotionally and socially. Understanding how to take turns is frustrating and takes time. In the classroom, teachers create activities that encourage patience, turn-taking and following directions. One of the most beneficial ways to promote these skills is by naming and role-playing emotions. Young children need to be able to identify and name their emotions so parents and caregivers can give them the tools to help them be successful in school, community and family life. Families can play a game to help bring awareness and acceptance to emotions. I created these emotion cards to play with like a game of memory. This is a good game for young children because it can be modified to all ages. For infants and toddlers, parents and caregivers can look at the cards with children and name the emotion. They can act out the emotion and encourage the child to mimic it back. For older toddlers to preschool children, parents and caregivers can begin to play the game. Start by making sure all the pairs are present. Shuffle the cards and place them face down in a grid on a hard surface. Take turns looking for matches. If a person makes a match, they can take another turn. Continue until all the pairs are found. Count the pairs to see who has the most.